Those using Android Pay today are in for a surprise. 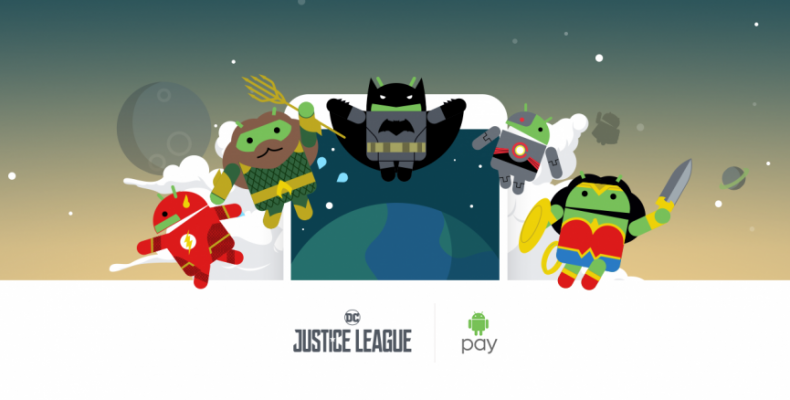 Similar to the animations of Halloween haunts, space explorers and Wimbledon players in the past, five Android bots have been transformed into Justice League themed Super heroes to celebrate the release of the upcoming movie, Justice League. Beginning from the next few days’ right up to December 31, these Super hero Android bots will be seen sprinting, soaring and fighting to defend the planet while you are making payments with your phone. How did the app acquire this theme involving these heroic characters? It all started in 2016, when the team members of Android Pay designed an animation, which consisted of an Android bot in the costume of a space explorer, as a surprise to their fans. This little surprising and pleasant transformation turned out to be so popular among the users that the team was inclined to create more of such animations, taking inspiration from events and celebrations from across the globe such as Diwali, Halloween and the Chinese New Year, among a few. Users will have to make sure they have downloaded the most recent version of Android Pay on their phones and have added their credit or debit card. Then users will stand a chance to collect any or all of the famous DC super heroes such as Batman, The Flash, Wonder Woman, Aquaman and Cyborg when they make a payment in stores. Users will not know which super hero until they have tried collecting one. Even though Superman does make an appearance in the movie, it is not clear whether he will available on Android Pay as a collectible bot. Users will have to keep using Android Pay in order to collect all the characters. You can check on your progress and keep yourself updated on your collectibles in the app itself. Since the underlying theme of the Justice League is to save the world together, you can also seek the help of your family and friends in your own quest. Tap on the bots in Android Pay and share them with your family and friends, inviting them to join in the mission. If you are ready to unlock and discover your superpowers, look forward to the next few days. In these days to come, this new transformation in Android Pay will be seen in United States, Australia, United Kingdom, Poland, Canada, Russia, Taiwan, Spain, Singapore and Hong Kong.